Atex Freight Broker Training One-On-One, Live in El Paso, Texas Bring your Spouse or Partner FREE! (surcharge applies to Sat., Sun. or any Holiday). if the “free” person desires their own materials. 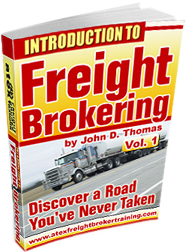 Get Started on Setting Up Your Very Own Freight Brokerage. Start Getting Customers Within 30 Days or Less. Learn What It Takes to Start, Maintain and Succeed in Your Very Own Business. Get In Now On This Gigantic & Exciting Industry! This two and one-half day Freight Broker Workshop will be attended by you and your spouse or partner if you choose to bring someone. You pick your two and one-half consecutive days Monday thru Friday and call us to check our schedule. About a two-week deposit and notice is required. (In a few instances, a five to ten day notice will work). Act Quickly! Shippers need YOU to help move their freight! Email us for more information or call: 1-888-526-ATEX (2839) – talk to John. A completed questionnaire may be required prior to classes to help us custom-tailor the training. Any man, woman or younger person who has a burning desire to start their own business. Prior formal education or experience is NOT required. This could include truck drivers, transportation workers, logistics personnel, stay-at-home moms, recent college or high school graduates, retired or semi-retired or anyone who desires to be independent business owners. Your workshop will be conducted by John D. Thomas, founder, CPA and President of Atex Freight Broker Training, Inc. John has nearly fifteen years’ experience with his freight broker training. He is a Certified Public Accountant by profession with over 30 years’ experience with small business start-ups. His strength is in helping people get organized with an emphasis on getting geared to run a business and creating effective marketing strategies for success. There are two primary reasons businesses fail in addition to lack of money. John has proven expertise in both areas. The entire program is based upon John’s current freight broker training, his previous freight brokerages, Atex Freight Brokers, Inc. and Atex Logistics, Inc. MC#453560 AND the many years working with small business start-ups. This training will focus on truck brokering within the 48 states. Bring your lap top – we may use it on the third day . Otherwise, we will use our 23″ monitor to view the training manual. Register Now With Your $1,800 Deposit Here Below. UNABLE TO ATTEND THE LIVE EVENT?